Full schedule ahead! But before boring you with all the details about my day, this is what I'm wearing on this bright lovely morning. 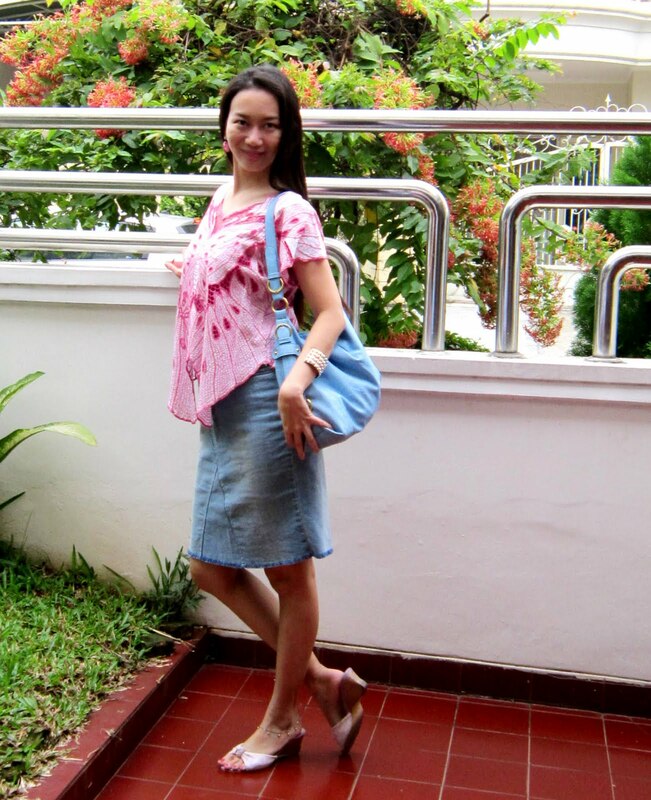 Pink embroidered butterfly top: from Bali. Skirt: made over from an old pair of jeans. Sky blue bag: Les Catino. Lavender wedges: Yongki Komaladi. Pink earrings: Aldo. Bracelet: Naughty MKG. My second brother's business trip/vacation in Indonesia is finally over, and my parents, my eldest brother and me, are escorting him to the airport where he will catch a plane that'll take him all the way across the Pacific Ocean back to USA. The flight will take approximately 28 hours, so, good luck bro! 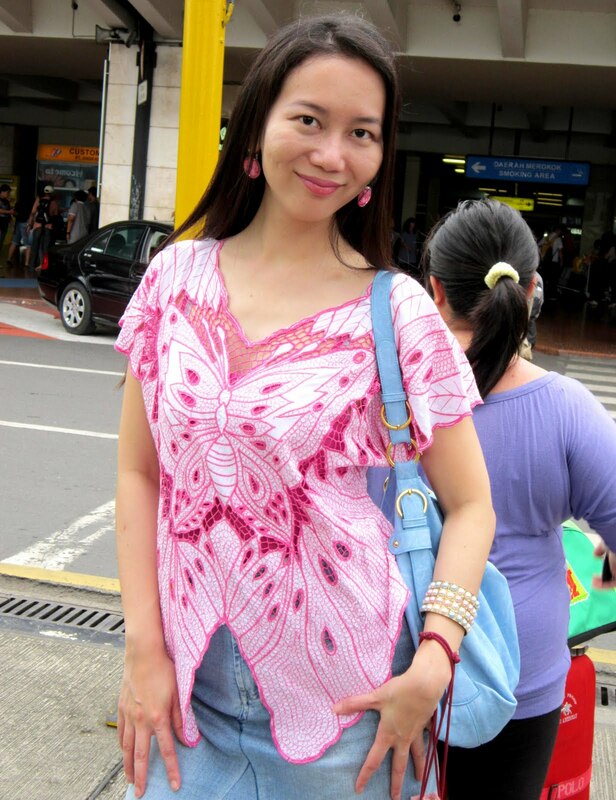 I found this ethnic, handmade, pink embroidered butterfly top in a small shop in Bali. There were many similar tops being sold at various Bali art markets, but mostly they were white. So, when I happened across this pink lovely thing, I knew I just had to have it eventhough I usually do not wear anything too ethnic. Guess the seller could see from my face how much I coveted this top, so she refused to lower the price! Ouch. I know it's a bit overpriced, but I don't regret buying it. This butterfly top is so pretty and unique, and given the same amount of money, I know I'd never find anything like this in Jakarta. 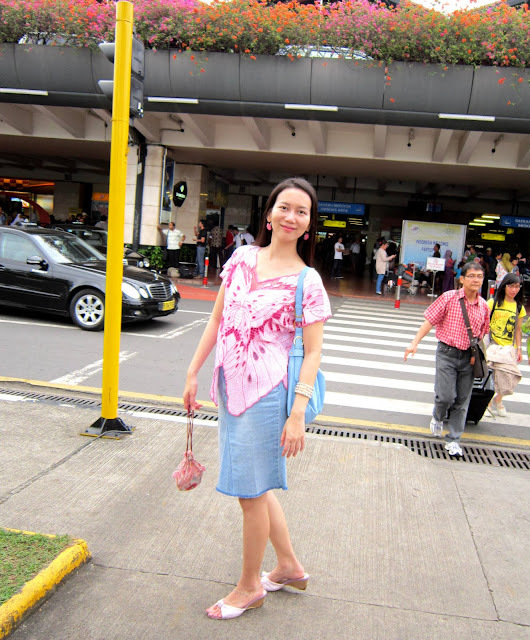 My Mom took these pictures while we were waiting for the car at the pick-up area. From the airport, we went straight to Central Park for dinner and some shopping. And my oh my, what do we have here! 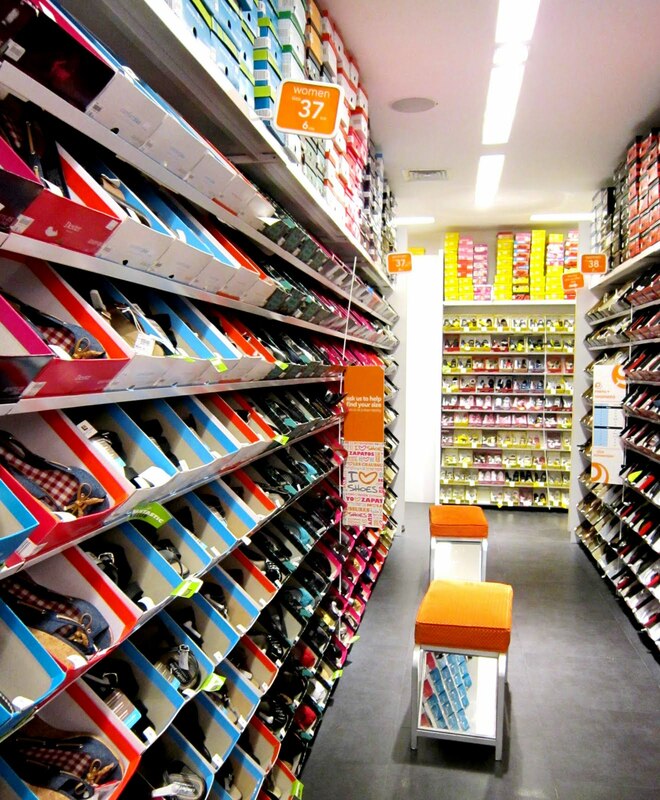 Say hello to an old "friend" from the US: Payless Shoe Source! I didn't know they have opened a store in Jakarta. Talk about de ja vu! The store looks exactly what they have in USA. Even the way they arrange the merchandise according to shoe size. When I was a poor international student with no income across the ocean, ok, even after I had a full-time job and made some dollars pasca graduation, this store, together with other discount retailers like Ross, Kohls, Target, and Walmart, were my (fashion) life savers! The styles are cute and up-to-date, the prices are affordable, it's like a shoe haven. 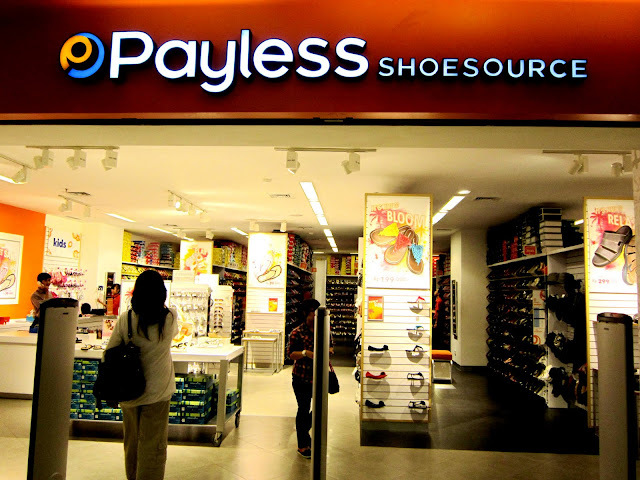 Most of Payless products were made in China, perhaps that's why they could come up with such low prices? My brother always teased me for buying my shoes there, since he himself wears expensive designer brands, and I wear mostly discounted brands, but I didn't care. I still don't. I'm a frugal gal and proud of it, babe! However, after browsing around, I realized that in Indonesia, Payless is no longer a pay-less place. 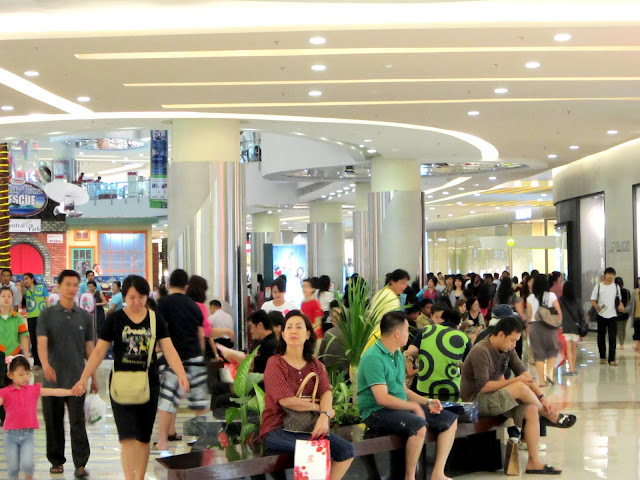 In Indonesia, shoes and clothings are so cheap, much cheaper than in the US, that what I used to consider as cheap there, is not cheap here. In Jakarta, Payless' prices are just like any other shoe prices you find at major department stores like Centro, Matahari, Metro, and Sogo. *Cryyyy...* However, it's so good to roam around in a Payless store again! Feels like the good ol' days! 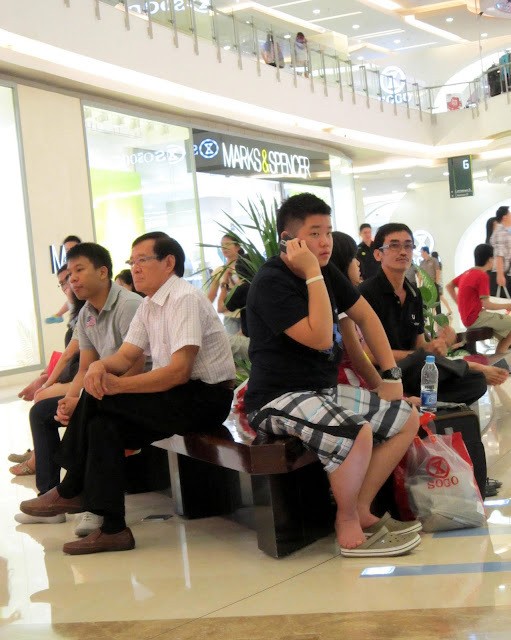 Two weeks ago, on July 1, Central Park was having a midnite sale, and here are some snaps. Usually the mall is closed at 10, but this pic below was taken around 11.30 pm and the crowd was still huge, the restaurants were still open, and the music was blasting from loudspeakers! My Dad took this pic of husbands, fathers, boyfriends, brothers, who were waiting their ladies doing their favorite sport: shopping! Haha! Look at their bored expressions. Poor guys! Love that shirt! Such a cool design.